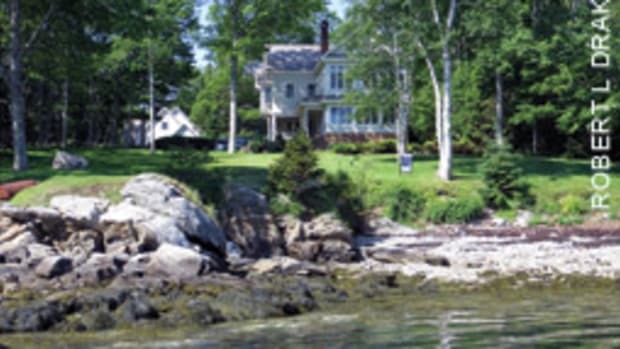 Imagine spending a quintessential Maine summer on your own private 25-acre island, following winding trails through evergreen woods to tidal pools, bold granite ledges and a pebble swimming beach. 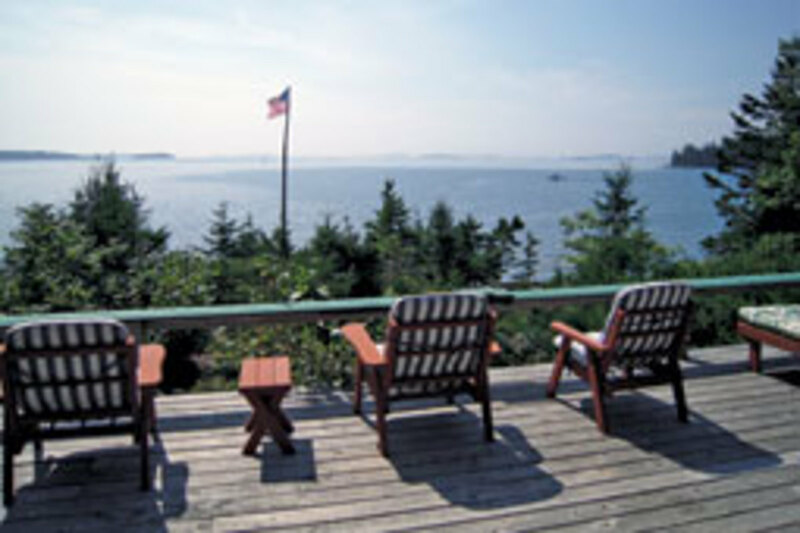 Beneath sweeping southerly views of Penobscot Bay from your cabin’s capacious deck lies Bucks Harbor’s busy yachting activity. 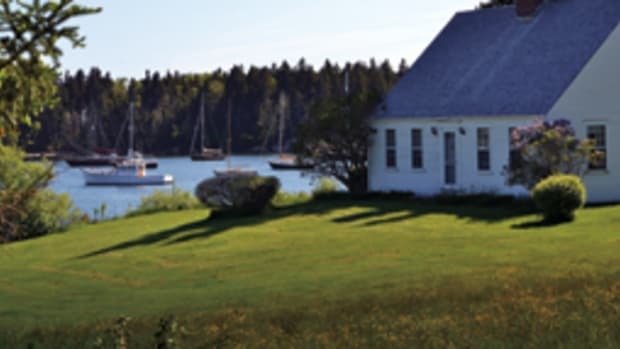 “It was like school, church, family and fun, all rolled together,” says Ben Waller, grandson of the current owners, Jim and Rachel Kurt of South Brooksville, Maine, and St. John, U.S. Virgin Islands. Now Jim and his wife are reluctantly selling the island. “We and our families have matured and now are enjoying other things rather than spending the summer here,” he says. 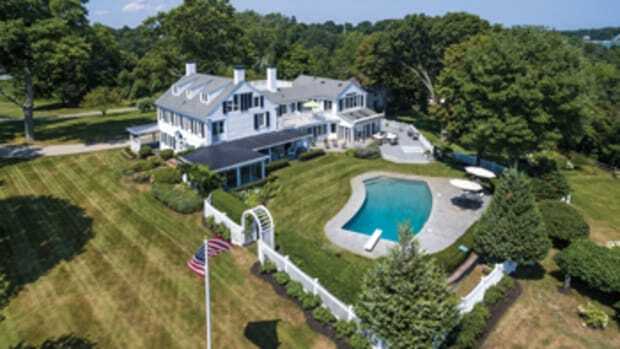 They are asking $3,950,000 for the 25-acre wooded island, which has a 900-square-foot fully furnished cabin, a dock and float in a protected narrow cove with 7-foot depths at mean low water. Access to the island is via private boat. 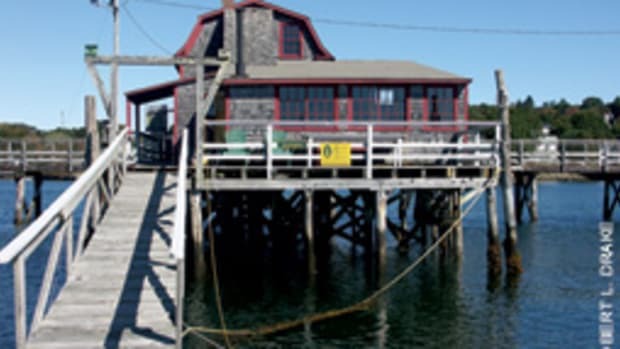 Mainland dockage and vehicle parking are available at the town dock, Bucks Harbor Marine and, for members or those with reciprocal privileges, at the informal, active Bucks Harbor Yacht Club. 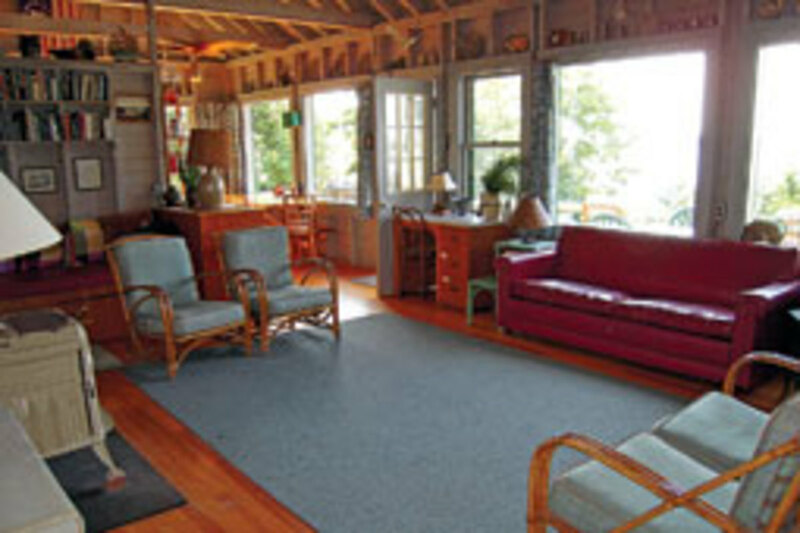 The two-bedroom, one-bath cabin with sleeping loft (which Kurt says “holds three kids nicely”) overlooks Penobscot Bay and the entrance to Eggemoggin Reach. 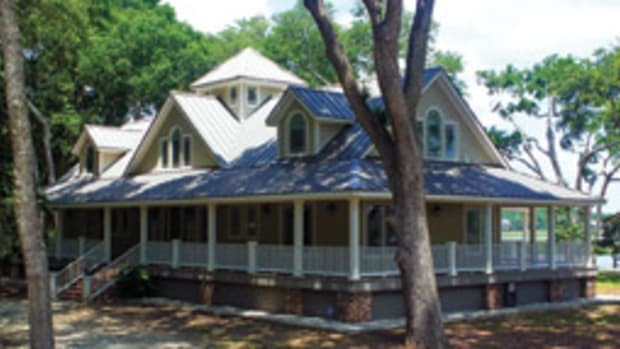 The 16-by-32-foot waterfront deck with gas grill and adjoining covered porch simplify entertaining a crowd. 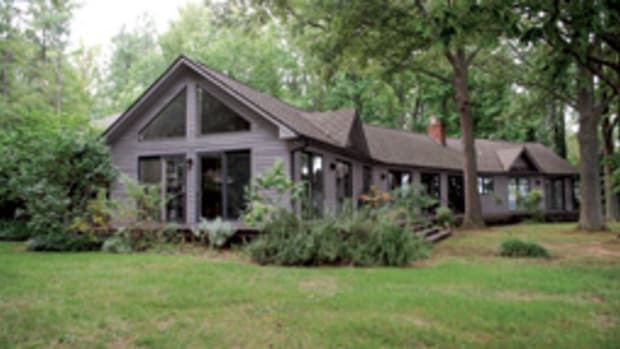 The kitchen is fully equipped with cabinets, a microwave oven and a Pyrofax propane-powered range, refrigerator and water heater that use a couple of 100-pound gas tanks each season. A 2-cylinder, 4,500-kW Onan generator outside the cabin powers lights and small electric appliances. The inside bath with shower has an exterior door, convenient for sandy beach-goers. Harbor Island protects Bucks Harbor, creating an excellent, well-used anchorage and hurricane hole. 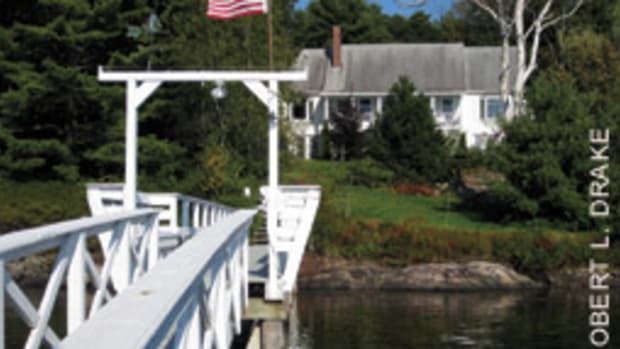 “We like [to sit on our dock] and watch the windjammers drop anchor, the yacht club’s sailing classes and races and all the cruising boats,” Kurt says. Bucks Harbor visitors enjoy South Brooksville’s traditional small-town ambience. In the village, full-service Bucks Harbor Marine sells gas and diesel, and the general store boasts an art gallery and restaurant. The town of Blue Hill, a 15-minute drive north, offers art galleries, boutiques, musical performances, shopping and a variety of restaurants. The city of Ellsworth on Route 1, a 30-minute drive, has shopping, major chain stores, services, a full-service hospital and highway access to Acadia National Park. This article originally appeared inthe July 2012 issue.